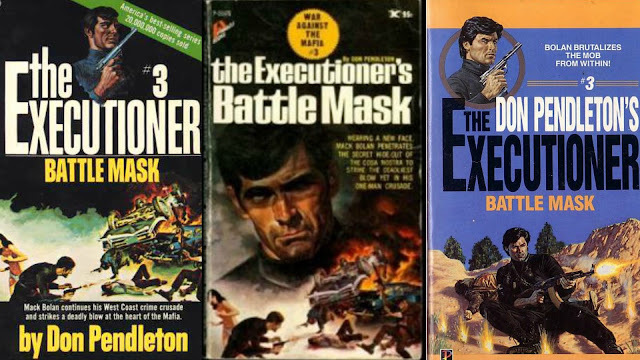 Don Pendleton continues his "The Executioner" series with this third entry, "Battle Mask", released in 1970 via Pinnacle Books. In the last book, "Death Squad", we saw protagonist Mack Bolan target two Mafia families in L.A. Bolan's crew was wiped out during their attack on Julian DiGeorge and his mob family. DiGeoge somehow escaped in the book's finale and Bolan continues to be pursued by law enforcement and Mafia hitmen after bringing war to both the east and west coast families. "Battle Mask" begins with Bolan recounting the firefight that killed off his death squad of colleagues and friends in the last book. DiGeorge enforcers arrive being led by Lou "Screwy Looey" Pena. Bolan sees their approach and lights them up with flares and a .50 caliber before rolling out. On his way to Palm Springs he is tracked by more enforcers and manages to kill off a few with an assist from an older man. Bolan switches vehicles and arrives at New Horizons, a plastic surgery facility ran by one of his old war buddies named Brantzen. The author provides a little backstory on how the two of them used to supply medical help to villagers in Vietnam. Bolan asks Brantzen to do a new face so he can avoid the numerous detectives and hitmen that are hunting him. Brantzen agrees and Bolan gets a "battle mask". In the meantime the search continues for Bolan via Captain Tim Braddock of the LAPD. He is one of the main characters and was featured in the last book. His investigation and pursuit deemed "Hardcase" is heating up. Sergeant Carl Lyons is in on the action and is playing a bluff on Braddock. In the last book Lyons allowed Bolan to escape and soon Braddock realizes that Lyons isn't too motivated to capture Bolan. He dismisses Lyons from the investigation and I am assuming this will eventually lead to Lyons joining Bolan's fight in later books (an early peek ahead shows Lyons as an Able Team member). One of the more enjoyable parts of Pendleton's "The Executioner" debut in "War Against the Mafia" was that Bolan joined the ranks of the mob to kill from within. Like that book Bolan does the same here. With his new face he infiltrates DiGeorge's family by teaming up with the don's daughter Andrea. She has a dislike for her father and senses that his goons had something to do with the murder of her husband. Bolan disguises himself as her fiance, a Mafia good from New Jersey named Frank Lambretta. Soon DiGeorge hires Lambretta to be an enforcer and pegs him as Frank Lucky. Once Bolan accepts the job as mob enforcer to DiGeorge he begins a careful dissection of the family and their assets. He spills important dates and deals to Carl Lyons and between Bolan and the police the DiGeorge empire is slowly dismantled. Bolan targets Pena and his crew as well as a enforcer named Marasco. 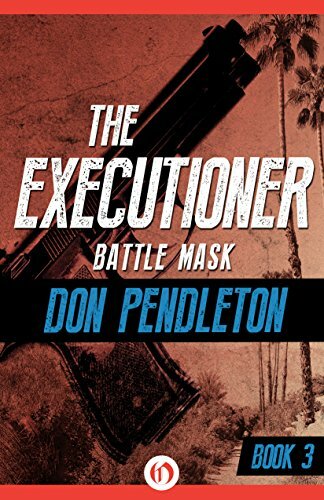 In typical Pendleton fashion the reader is thrust into car chases and shootouts as the noose is placed on DiGeorge. The climax could have been a little better but I'm not complaining. The end result is a really good rebound from the lackluster "Death Squad". This third book in the series recaptures a lot of the high-octane action of the debut and is spread throughout the book in many different angles. Aside from the Mafia portions there are some really good side-stories that sort of break up the detective work being done by both Bolan and Braddock. Overall a great book and one that sets the series back on course.